Underused cold hardy evergreen tree that has fascinating and handsome foliage and tolerates full sun to total shade as well as summer drought. 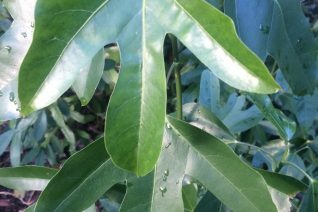 Umbrella shaped tree with glossy large triple lobed leaves that become entire on adult foliage. Slow growing to 17′ tall and half as wide. Attractive pale tan bark. Very tough and adaptable small tree. Green flowers in summer become black berries by autumn but are almost always stripped by birds. Great branching structure and form in time. Very cold hardy and deer resistant.